Biographies can be an acquired taste, but South Sound native Colleen Frakes has drawn on her own experience—quite literally—to recount her origin story in a fun and whimsical way. This mild-mannered librarian by day and cartoonist at large has created a graphic novel portraying her life as one of a handful of Washingtonians ever to live on the infamous McNeil Island. Never been to McNeil? Well, you probably wouldn’t have; not unless you were incarcerated between 1875 and 2011. The island, roughly 6.5 miles of land south of the islands Fox and Anderson, is west of the mainland and accessible only by boat or by plane. America’s last and largest island prison closed in 2011, but until that time, it was home not only to inmates and wildlife (McNeil is also an active nature preserve) but also to a small, close-knit community. Residents of McNeil consisted almost entirely of prison personnel and their families, roughly fifty in all. Colleen Frakes was counted among their number. This Ignatz award recipient details her peculiar—and yet familiar—experiences growing up in this company town in her September release Prison Island. 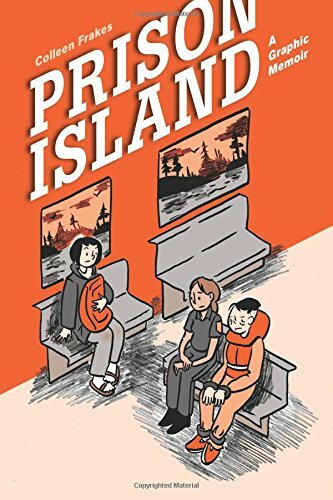 An expansion on her already successful mini-comic Island Brat, Prison Island takes a wistful and genuine look at a piece of history as a matter of course. Colleen attended school, went out with friends and explored like every other teen, but her story has a small town twist with a dash of zany detail. This book is a must-read for lovers of history, those who appreciate coming-of-age tales and anyone who has a penchant for artfully composed comics. With panels that recall the polished, minimalist sketches of The New Yorker, this relatively short read is charming, witty and hard to put down. Don’t just read about Prison Island—hear about it straight from the source. Tacoma’s Destiny City Comics will be hosting Colleen Frakes September 5th from 2 – 4 PM. This award-winning author/illustrator and Xeric Grant recipient will be available to sign books and dish about her life on Prison Island.